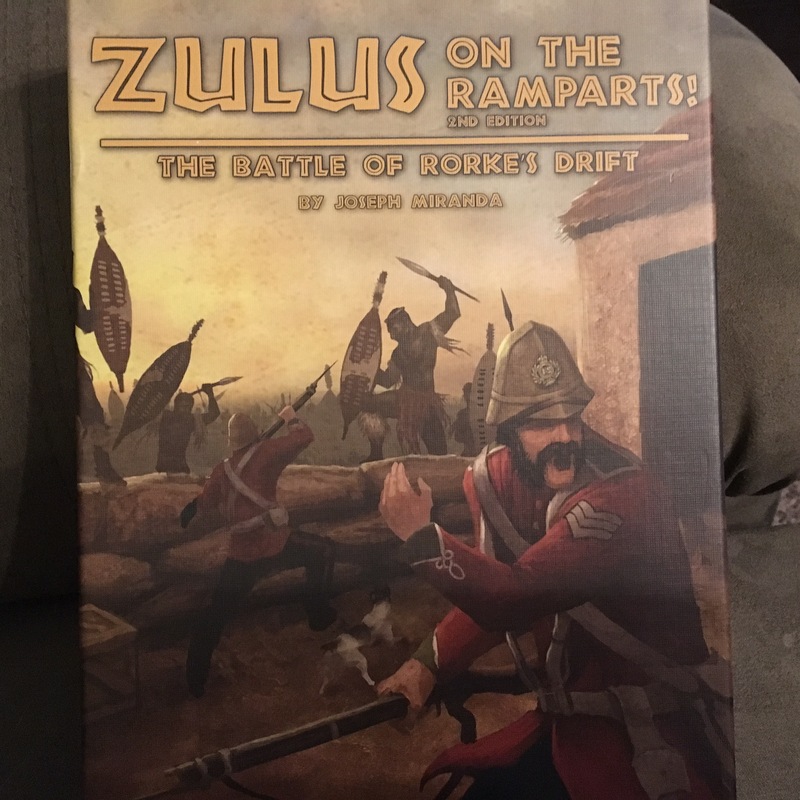 Today I was able to get in my first game of Zulus on the Ramparts from Victory Point Games. It is one of their solitaire States of Siege games, this time modified by Joseph Miranda. 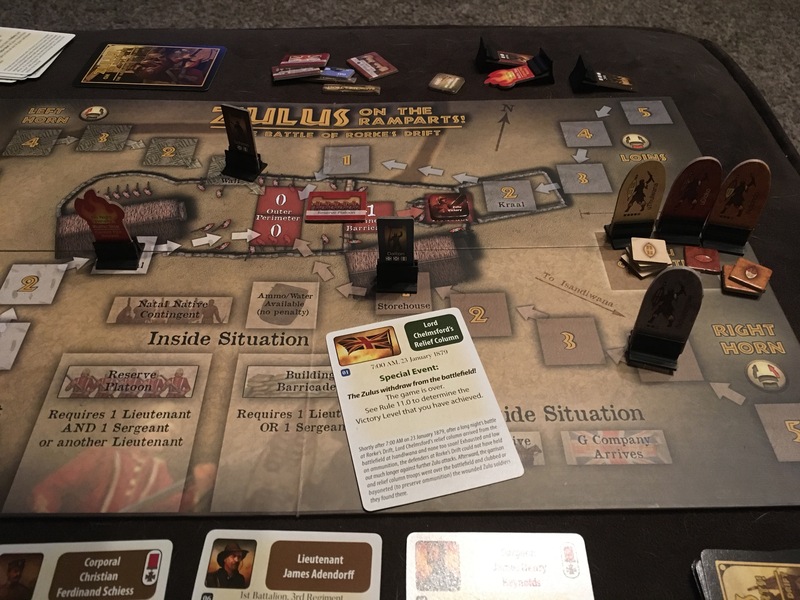 In this game you play the British defenders who must hold off the approaching Zulu warriors. All of your volley cards, and the free volleys from you leaders, cannot reach beyond space #3. You are going to want to maximize the effects of your volleys (1-4=miss, 5=Zulus retreat 1 space, 6=one hit) by not forcing the Zulus to retreat out of range. The best thing to do is to only fire when they get to spaces #1 or #2, get some hits and retreats, and then maybe finish them off at space #3. In the photo above, I was able to destroy the Zulus near the North Wall by firing two volleys in a row. 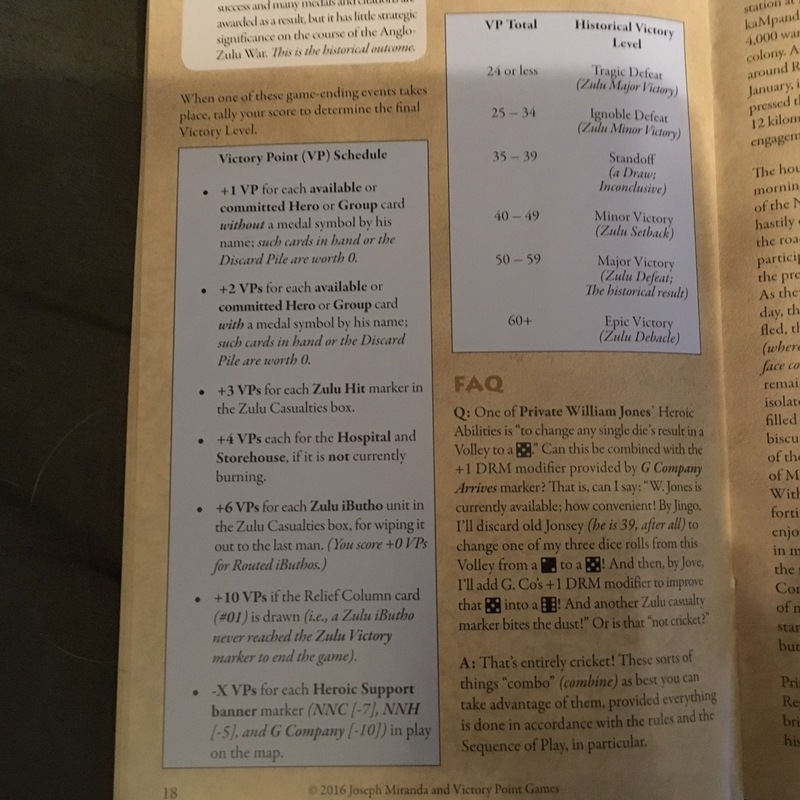 Firing instead at the Zulus only half-way to the hospital will most likely only allow a single volley to be shot at them. Moral of the story: Let those Zulus get close…and then blast them. Completely eliminating a stack of Zulu is much preferable to just forcing them to retreat. You have a lot of things to do (resupply the ammo, build a barricade, fire volleys, form a reserve, play a leader) and you get only 1 action per turn. Later in the turn you will get to draw a card and play one leader for free. Thus, you might be tempted to use your single action on anything other than playing a leader. This is a bad idea. Most of the other actions require leaders, sometimes two of them. Moreover, leaders can use their free action each turn, and a bunch of them fire a free volley. The sooner you get those leaders into play, the sooner you will be building barricades, supplying ammo, etc. In the photo above, I have 4 leaders “available” (in other words, played from my hand and now each can use their abilities). My ammo is already supplied (the low ammo marker is missing from its box) and I have already built one barricade. Moral of the story: playing leaders with your one action should be like voting in Chicago—do it early and often! 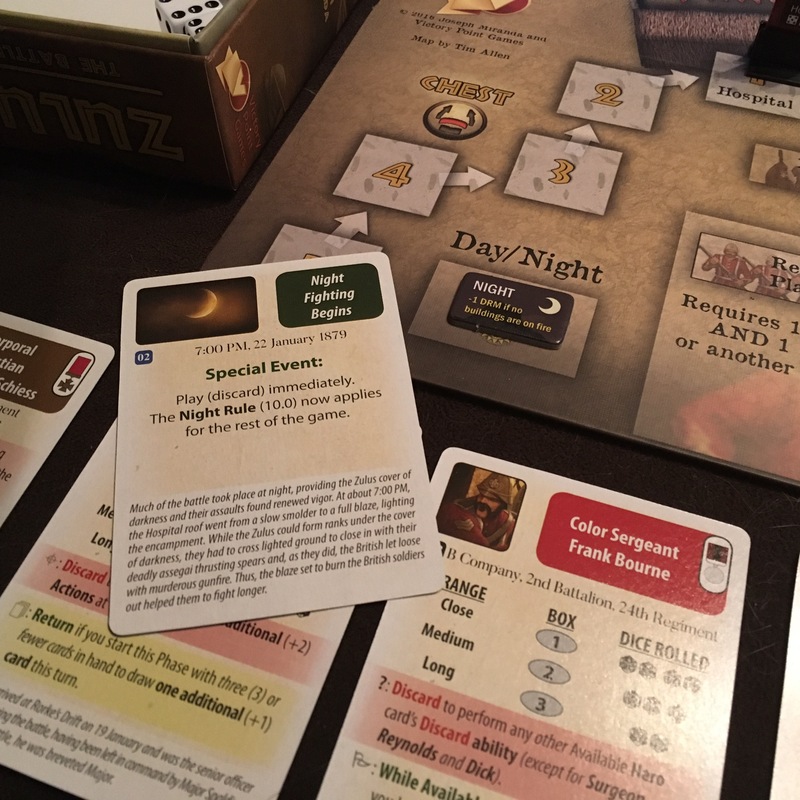 Once you draw the Night Fighting Begins card, none of your volleys can kill anymore Zulus, you can only drive them off. The -1 DRM (die roll modifier) is going to sting. How can you deal with it? You need a burning building to provide light! If a building is already burning, do not try to extinguish it. If nothing is burning, pray that you draw a building on fire chit! The disadvantage is that you can’t fire at Zulus on the other side of the building (and any heroic defender in the building is removed back to your hand) but this is a small price to pay to lose the -1 DRM as that glorious fire lights up those approaching Zulus all over the battlefield. Moral of the story: Burn baby burn! If the game goes on long enough, you will draw Lord Chelmsford’s Relief Column which ends the game. Why is this a bummer? Because maybe you had the Zulus almost completely destroyed! In the photo above only one Zulu stack was still on the board, albeit with a chit beneath it (each chit is worth one hit, as is the standee). Those silly Zulus stayed just out of range (at space #4) for about 10 turns. Zulu movement is by random chit draw, and there are a lot of chits in the cup so movement is quite random. So those Zulus stayed away from me—It’s like they knew that I was sitting on volley cards to blast them! Anyway, the game was very, very dull during those turns as I literally had nothing to do on my turn other than draw a card and play any leaders. My only hope was that those Zulus might eventually move into range—but then I got rescued instead. Moral of the story: See note #1. Don’t accidentally retreat those Zulus before they move within close range, you might not get another chance to blast them. With only the roll of a 6 eliminating Zulu units, you gotta get lucky. A couple times I rolled a pair of sixes with only 3 dice. I eliminated 9 of the 10 Zulu chits plus 3 of the 4 standees. This really helped when scoring your game on the Victory Point Schedule. The points for eliminated Zulus counts quite heavily toward the result. 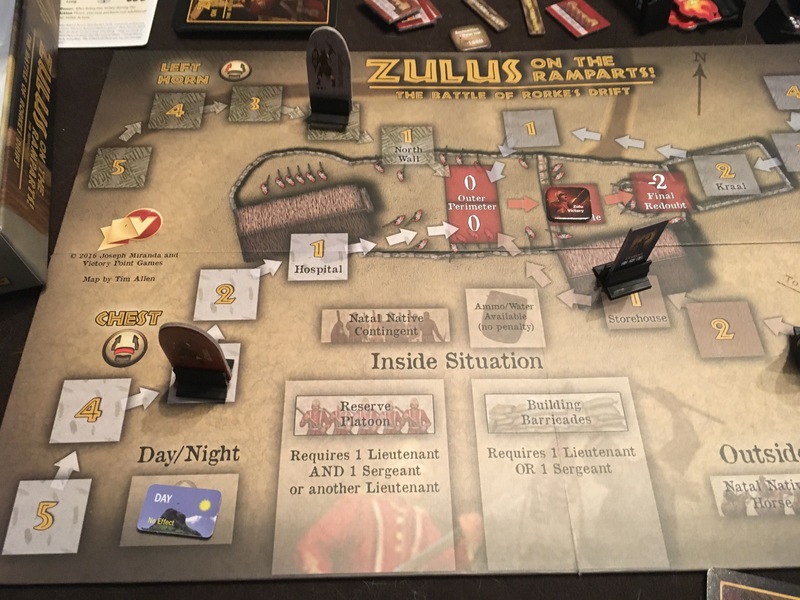 I got 9 points with leaders/groups, 27 for Zulu hit chits, 4 for one non-burning building, 18 for the Zulu standees, and 10 for the relief column for a total of 68 — Epic Victory/Zulu Debacle! Moral of the story: It can be better to be lucky than to be good! 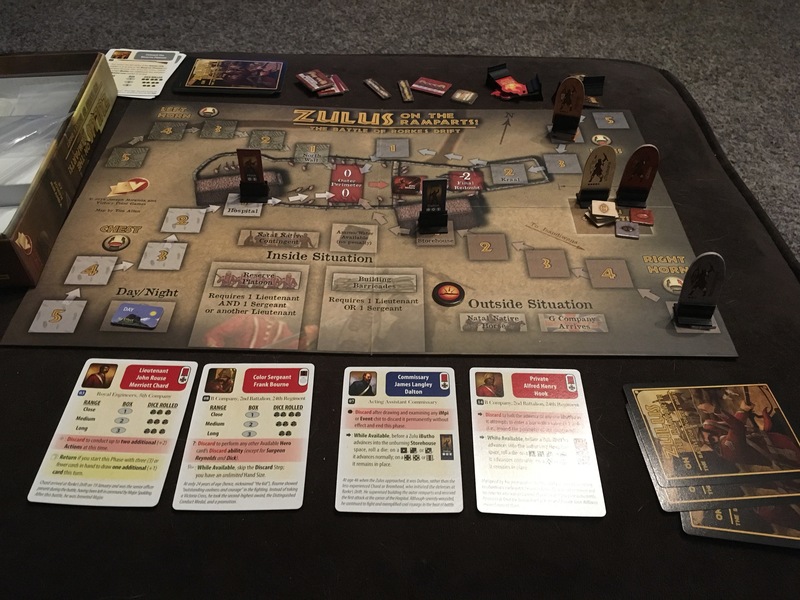 Zulus on the Ramparts is not as deep nor as challenging as Hapsburg Eclipse, but it has a very fun sense of danger as the Zulus rush the gates. There are optional rules that add more cards, so I think that might add more variety and replay ability. Overall, it’s entertaining and if you read the flavor text, you might learn a thing or two. If you like solitaire games that resemble a “tower defense” game, give it a try! Review, What Did We Play?